Those who follow my weekly updates will know that I've been reviewing a long first draft, which has meant less news than usual from me on virtually every other front since late May. As I've had quite a few people trying to guess what I'm working on, and because groundless speculation inevitably leads to madness (or at least confusion), I asked Steve if I could share with you, and he said, "Yes." So . . . I am reviewing the first draft of a new edition of the Discworld Roleplaying Game. 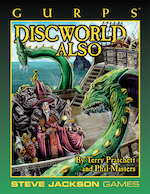 Phil Masters took the original, folded in GURPS Discworld Also, updated everything to take into account Terry Pratchett's tireless efforts since the previous edition (for instance, Going Postal, Thud!, and Unseen Academicals), and switched the rules over to GURPS Fourth Edition. As a result of all this folding in, updating, and switching over, the first draft is large . . . We're aiming for 400 pages, and as is customary in the RPG business, the first draft is considerably beefier than the target length. Thus, the review alone is going to take me a while! So that's where I've been. 2. If you don't get either of these comments, then you're dangerously uninformed about trolls. Today is the first day we're back in the office . . . well, some of us are taking a few extra days. But the office is back online, Warehouse 23 is working through the orders queue, and the overflowing inboxes are being tackled. If you e-mailed or called us over the last week we'll respond as soon as we can, but please be patient -- we've been gone a whole week.